"Seven Steps to Solar Schools"
The HELiOS model works for most school districts because it combines favorable financing, utility-administered rebates (when available), and efficiency and conservation measures, to make it possible to install a renewable energy system that produces all, or much, of a school's electricity without increasing a District's operating expenses. Financing can come from a variety of sources including low-interest federal bonds or state loans, tax-exempt municipal leases, or voter-approved General Obligation bonds. Contributions in the form of in-kind support or participation on a district energy committee can also assist a district in achieving its goals to reduce energy costs and its reliance on fossil-fuel-generated electricity. How is it possible to pay for a renewable energy system without putting pressure on the General Fund? The most effective solution is for a district to ask the voters of the school district to support a construction bond that includes money for energy efficiency and renewable energy systems. Berkeley Unified School District is one of many districts in California that did this successfully in 2010, along with Oakland USD in 2012, Pajaro Valley USD in 2014, and many others. The electricity savings – which are substantial – are then available to support teachers and programs. Developing a no-cost Solar Master Plan can be an important first step in determining the size of the bond that would be used to underwrite the cost of renewable energy systems. 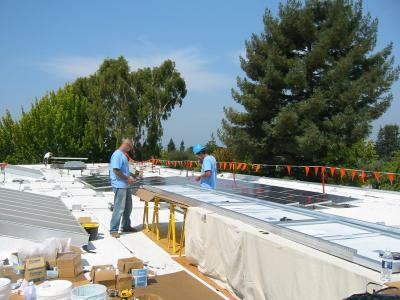 An example of a comprehensive Solar Master Plan is available here. Alternatively, districts can take advantage of low-interest financing and use the savings in electricity costs to pay off the debt. At the beginning of 2015, the IRS issued $600M in New Clean Renewable Energy Bonds (New CREBs) that districts can use for PV projects; the California Department of Education has Qualified Zone Academy Bonds (QZABs) that can be used for energy projects at schools where 35% of the children receive free/reduced cost meals; interest rates remain low; PV costs continue to decline; and installation costs have been held in check by intense competition among solar vendors. Electricity prices continue to rise, although more modestly than in years past. By using low-interest financing, repayment of the loan or low-interest bond would come entirely from the electricity savings. The HELiOS target is to ensure that the payments on the financing instrument are less than the savings from the avoided electricity costs. In that case, the PV transaction becomes revenue-positive and the district’s General Fund benefits from the day the PV system goes online. Contact us for more information on the underlying financial calculations and assumptions that can help you determine what it will take to make a PV system revenue-positive for your school district.